Voting is open! Check out the 2013 shortlisted finalists! 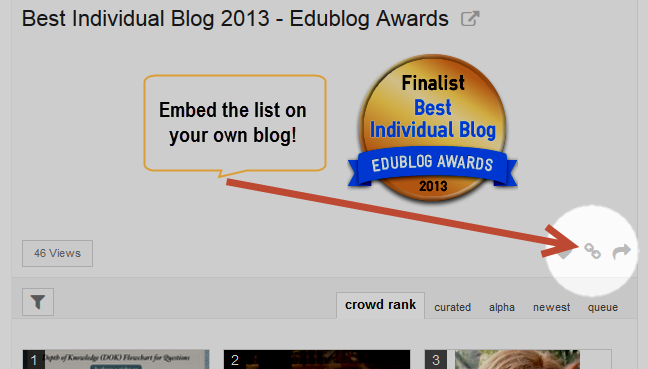 Voting is now open in the 2013 Edublog Awards! Voting will close at 11:59pm EST on Wednesday, December 18th. Use the links above or the top menu to see all of the finalists – those moved through to the voting round. If you are a shortlisted finalist, grab your badge from the top of your category page and it place in your sidebar linking back to the poll, you will be listed on those pages forevermore so wear ‘em with pride. We’re shaking things up a bit by having public voting using List.ly. vote for more than one of your favorites! embed the actual list and let people vote right on your blog! You must login with or create a Listly account to vote – this is the only way we can make it fair so you can only vote once per finalist per category. Let us know in the comments below if you are having any problems with voting or have any questions. 2. Create a Listly account or signin to your Listly account. 3. Go to the Awards Category you want to vote on. 4. Click on Vote Up arrow on the blog, website or person you want to vote for. On the top right of each list, click the middle “chain link” icon. Paste this code into the text tab in your Edublogs or most WordPress blogs. Those that have participated in the awards in the past know that historically we’ve had a live ceremony webinar to announce the winners. However, since you are able to see the leaders constantly, that kind of takes away all the suspense. So, we are going to try instead to make the announcements here on the blog instead. We’d love to hear your feedback and ideas on this as well. Now go vote and discover great new blogs, resources, and people to follow! How are students under the age of 13 going to be able to vote as you have to join list.ly I think to make the vote? Hi Miss W, just adding a comment here so that everyone knows what we discussed. We’ve used Listly this year for several reasons. 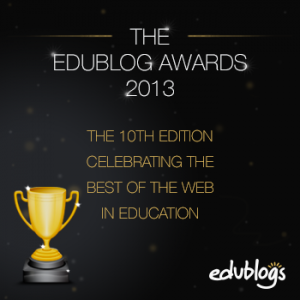 An important reason is the Edublog Awards is all about introducing educators to new resources. Content curation is an important trend and Listly is just one of the tools educators can use for content curation. Listly also automatically brings the information into lists into a visual format that helps people see the resources better. Students under 13 can ask their parents to create a Listly account and help them with the voting. A PollDaddy for Student blogs and class blogs has been added to the Student Blogging Challenge ( http://studentchallenge.edublogs.org/ ) so that students can have their own voting. We will add the information from the PollDaddy voting to the finalist post on the Edublog Awards website. I can see the PollDaddy for Student Blogs. Are you going to add the one for Class Blogs? We think we’ll keep it for students. We encourage students that don’t have social media accounts to login to Listly to ask their parents and other family members to vote. We know that Listly has made for a few changes to voting on what we are used to, but the benefits in how it organizes, archives, and displays the lists far outweigh these drawbacks, we believe. Thanks for your support here! We definitely appreciate the feedback and understand your concerns. In evaluating all of our options, we felt that giving listly an honest try was well worth it as we also see a ton of benefits that the poll options we’ve used before didn’t allow for. For example, IP blockers and methods to stop the same person from voting a hundred+ times for the same entry work, but not always. This one per account public voting lends true endorsement and authenticated credence to the entire process. That being said, this entire process is for the community in hopes of spotlighting all of the great work out there, so we definitely welcome more feedback and ideas! How often can people vote – just one time per category, or one time per day per category? People can vote once total for each entry in a category. However, each person can “upvote” as many entries in each category as they want. For example, you can vote for 5 entries in the same category if you want to. Great work Sue and Ronnie! You continue to support social networks in the best possible ways and encourage students and teachers to share the wonderful wok they do in their classrooms. Thanks for all the work that you do to recognize the diversity of individual, class and teacher resources in the blogosphere. Here are the links if your younger students wish to vote for the best student blog and the best class blog. They can vote for one blog each day from the same IP address. So remember to vote from lots of computers outside your school system. Teachers and adults, please vote using the list.ly format on the Edublog Awards site, don’t vote on our polls created for students. My blog name is not showing up on the librarian list and I can’t find out how to change that. Instead of showing Bulldog Reader Blog, it says Bridging books, etc – the description line. I’ve had comments that they can’t find the blog because it’s not showing up by name like the others. If you can help with this please, it would be great. I appreciate all your work and effort but feel it is necessary to voice that …. I totally get why you have used a tool like Listly but allowing them to “Manage my Contacts” is not good! This will definitely deter people from voting. Hi TJ, thanks for your feedback. I’m assuming you mean when you sign up it asks if you want to “Manage my contacts”? Quite a lot of services, including Twitter, ask similar question and you are normally provided an option to skip this option. Please let us know if you mean something else as we are always happy to follow up these concerns directly with Listly. Just FYI, One person voting on Mac/Chrome had trouble getting List.ly to respond, even after logging into Twitter. He switched to Safari, and it worked. Another person on Win7/IE could not get the pop-up to log into List.ly via LinkedIn to display… but Win/Chrom worked. Moral: if it doesn’t work, try switching browsers, especially if your machine is “locked down.” Never give up! Alternate moral: Human ingenuity trumps (and created) technology! Thanks for sharing your tips with others! We’ve had a few browser issues reported. There is a problem in IE 11 and we’ve alerted Listly to the issue. They are working on a fix. With the other web browsers it is often an add on or extension installed that is causing issues. Simplest solution is to try testing in another web browser to see if that solves the problem.